AT is the third chair in Wilkhahn’s range with free-to-move capabilities. It comes with a variety of design options and optional automatic weight adjustment, making the range ideal for flexible desk-sharing office concepts. In these settings, more and more height-adjustable desks are also being used to encourage people to alternate between sitting and standing. Unfortunately, the majority of staff don’t use this option because getting up from a normal seating height and adjusting the table or desk height takes up too much valuable time. 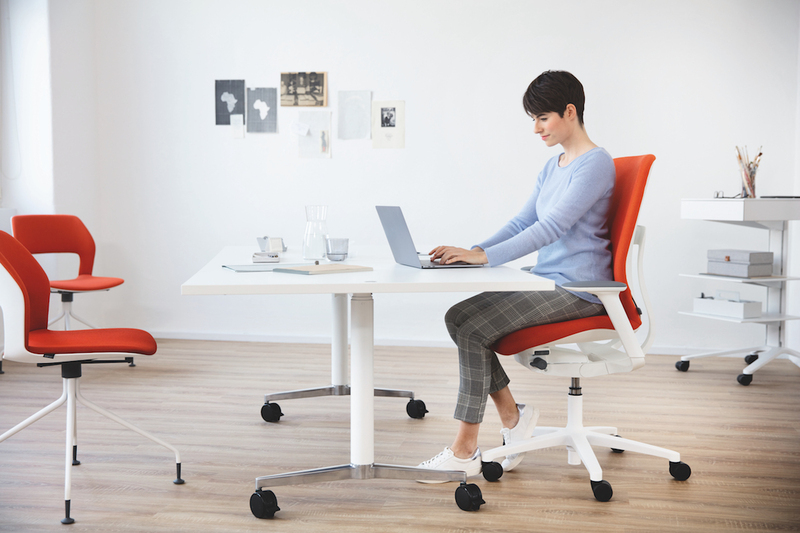 And this is where the AT office chair range with its elevated sitting position (ESP) comes in: this model can be used as a standard office chair with full 3D-movement capabilities but also adjusted to a seating height of up to 62 cm. 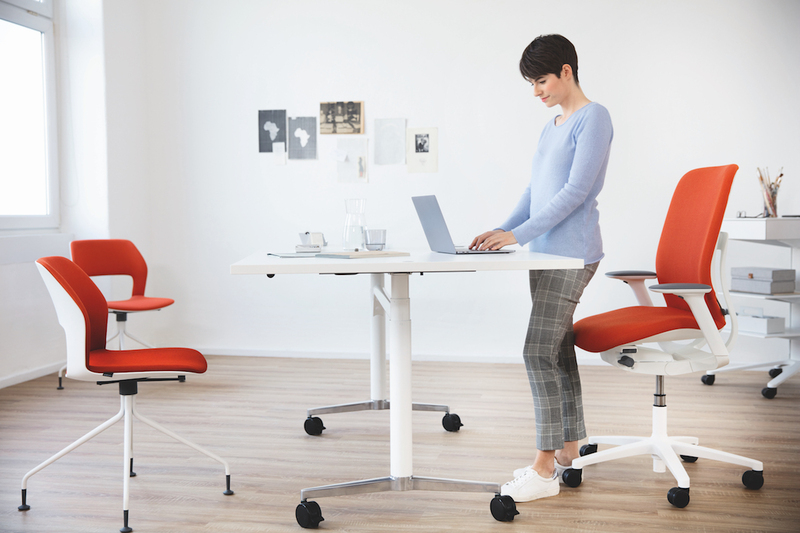 The elevated sitting position also provides new additional features: by activating the patented forward seat tilt, the office chair turns into a dynamic object to perch on while still allowing users to lean on the backrest. By leaning backwards, the tiniest shifts in weight are enough to stimulate the 3D flexibility of the pelvis and allow feet to dangle. On the other hand, the forwards movement doesn’t stop when people sit upright but almost automatically when they stand. Because the desk’s set to a greater height from the outset, it requires no resetting if people just want to stand for a short period. The impact is enormous: the desired change of posture between standing and sitting is intuitively incorporated into the body’s movements and the workflow. As a result, the extra investment in height-adjustable desks truly pays dividends. The AT ESP model with elevated sitting position is optionally available with automatic weight adjustment or rapid counter pressure adjustment. The chair has accessories for all sorts of different scenarios: from the adjustable lumbar support (standard) to 1D, 3D and 4D armrests, optionally with hard or soft armrest pads all the way to seat-depth extension that can be conveniently altered by turning a knob. Click here for everything you need to know about the AT office chair.